The post 27 Guilt-Free Keto Chocolate Cake Recipes appeared first on Keto Summit. Why give up chocolate cake just because you’re on Keto? It may come as a surprise that chocolate is a Keto-friendly ingredient, but it really is – you just need to make sure it’s the right kind you’re using. Sorry – the common milk chocolate is nowhere near Keto… A good rule of thumb would be; the darker, the better. I try to stick with 80-90% dark chocolate, and always the sugar-free/unsweetened kind. It’s perfect for baking but I have to admit, I do enjoy a piece with a cup of coffee, occasionally! While I wouldn’t recommend having chocolate cake every day of the week (especially if you’re on Keto to lose weight), it’s important that you get to enjoy your favorite dessert every now and then. I also love the fact that I can serve chocolate cake when my friends come over – it’s always hard for them to believe it’s “diet cake”! Even though you should choose sugar-free chocolate, it doesn’t mean your Keto chocolate cake has to taste bland. There are various sweeteners that are ok to use on Keto; here’s a great article to help you choose the right kind. I’ve included various different types of chocolate cake on this list, to make sure there’s something for everyone and every occasion. Dairy-free or even flourless is not a problem! And if you’re in a hurry, why not try a chocolate mug cake. It’s ready in minutes! –>> Click Here to see how easy it can be to make a decadent, Keto chocolate cake! Ingredients: almond flour, whey protein powder, baking powder, unsweetened cacao powder, baking soda, salt, coconut oil or ghee, eggs, vanilla extract, stevia/erythritol, coconut milk, coconut cream, 100% dark chocolate. 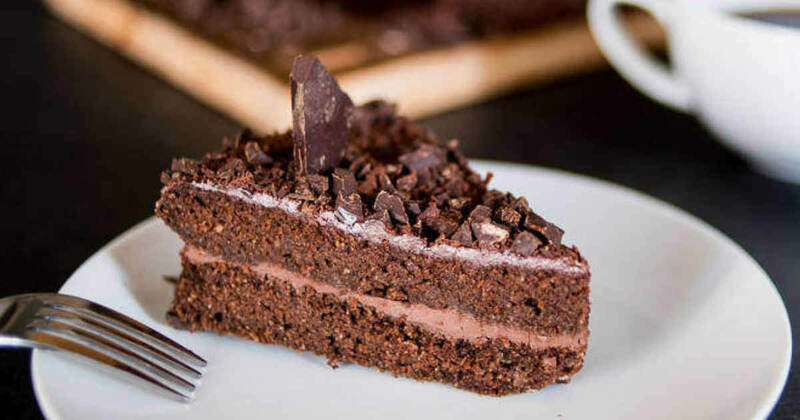 Even if you are following the keto diet for weight loss or health reasons, it can be nice now and again to treat yourself to something really special, so this chocolate cake could come in very handy! It is quite easy to make and looks really good, but like any cake recipe, it is important to follow the measurements exactly to get the best results. So next time friends drop by, why not share a layered cake to impress! Ingredients: egg, almond flour, ghee, baking powder, vanilla extract, cacao powder, erythritol, stevia, salt. Like most mug cakes, this delicious recipe is tasty and just sweet enough to satisfy without overloading on sugar. This chocolate cake can be ready in minutes, so this is a great recipe to use if you have unexpected guests – after all, who doesn’t enjoy chocolate cake? Serve this with a couple of fresh berries as a dessert or a sweet treat without affecting ketosis. This keto mug cake can be a great way to introduce the benefits of cacao as compared to cocoa as it has many antioxidants, but a much more defined flavor. This recipe takes only a couple of minutes to make, giving you a quick and easy cake for unexpected guests or for a simple snack to keep you going through a busy day. Making individual cakes also helps with portion control. Ingredients: water, salt, low carb sweetener, unsweetened baking chocolate, ghee, eggs. With only five ingredients, this flourless and keto-compliant chocolate cake is simple to make and would make a stunning dessert to serve to family and friends at a dinner party. It has a rich chocolate flavor but is not too sweet, so it goes well with any fresh berries. The cake has the same texture as a brownie and is quite dense, so a small piece will be enough. Ingredients: eggs, almond meal/flour, coconut flour, unsweetened cocoa powder, coconut milk, butter, granulated sweetener of choice, vanilla extract, baking powder, water. Now, this is something I never thought I would see on the keto diet – chocolate cake with fudge sauce – really?! Yes, it is true, even on the keto diet you can splurge on chocolate cake occasionally! This cake is low in carbs, gluten and grain free and makes the perfect celebration cake or dessert for a dinner party. The sauce thickens and sinks under the cake as it cooks, so don’t be tempted to stir it in! Ingredients: coconut flour, unsweetened cocoa powder, low carb sweetener (Pyure), ground cinnamon, baking soda, baking powder, salt, coconut oil liquified, eggs, vanilla, zucchini, unsweetened almond milk, sweetener (Swerve Confectioners Powder), egg yolk, butter, vanilla extract, unsweetened shredded coconut, pecans. The best thing about using vegetables in baking is that they help keep the cakes really moist, and the same goes for this one! The zucchini holds the key to moist and spongy cake, and using coconut flour makes this gluten and wheat free too. You can top the cake with the pecan frosting, or if your family has nut allergies, just use a topping of your choice that you know is safe for them. Ingredients: unsweetened cocoa powder, coconut flour, granular sweetener of choice, baking powder, sea salt, butter or coconut oil, unsweetened dark baking chocolate, eggs, unsweetened apple sauce (omit), vanilla extract, raspberries. Not only is this delicious cake low in carbs, but it is also grain and gluten free and stores in the fridge for a few days to increase the fudginess of the texture, so can be made ahead of time. This makes a wonderful treat for a loved one’s birthday, for Valentine’s or even for Mother’s Day. The raspberry sauce is tart enough to add a zingy burst of fruity taste to the rich chocolate but sweet enough for a sweet tooth. Ingredients: almond flour, cacao powder, coconut flour, coconut oil, eggs, vanilla extract, baking soda, liquid stevia, almond milk, butter, dark chocolate or unsweetened baking chocolate, cacao nibs. It can sometimes be a bit of a challenge to find a healthier cake for celebrations and birthdays if you are keeping things low carb and keto, so this recipe is perfect for your next birthday cake. It is rich and indulgent with a good level of chocolate taste and the dark chocolate frosting is the star of the show! This cake looks so good, even your other half will be impressed! Ingredients: eggs, cream of tartar, erythritol sweetener, stevia drops, cocoa powder, coconut flour, coconut oil or butter, avocado, almond milk or coconut milk, vanilla extract, sea salt, baking soda, apple cider vinegar. This is such a useful recipe – not only does it let you make amazing cakes, but it gives so many variations for people with diverse needs or issues. This is grain and gluten free cake, but if you don’t do dairy, there are subs explained. No-one needs to miss out on these little beauties which are pretty enough to serve as dessert at a dinner party or to make as a gift for friends. Ingredients: Paleo flour from Bob’s red mill, cacao powder, baking soda, baking powder, coarse salt, eggs, extra virgin olive oil, coconut milk, erythritol, unsweetened dark chocolate bar, ghee butter. Don’t worry if you don’t have bundt tins – although these little cakes look really pretty, the mixture can be poured into any cake tin. It might sound strange putting oil in a cake, but it just works as a binding agent and a way to keep the cake spongy. Suitable for both paleo and keto diet plans, these lovely chocolate cakes would make a great dessert after a family meal. Ingredients: Chocolate Collagen Protein Powder, coconut flour, swerve, cocoa powder, baking powder, butter, almond milk, vanilla essence, egg. This great recipe has an added benefit to other mug cake recipes as it uses collagen powder, which can be helpful in dealing with gut issues. It is also low carb and gluten free cake, ideal for keto folks. Mug cakes are really handy on an eating plan as they satisfy the need for something sweet but come in individual servings which can be really good if you have problems with portion control. Ingredients: almond flour, sukrin gold, unsweetened desiccated coconut, unsweetened cocoa powder, baking powder, unsalted butter, egg, vanilla essence, unsweetened shredded coconut, sukrin melis, hot water. Coconut and chocolate have been great partners for years, and in this keto cake recipe, they are the stars of the show once again! These cake bars are soft and delicious, and although there are a few ingredients, all you need to do is mix and bake! The cake bars are very popular with kids and grownups alike and could even be used as a treat in a lunchbox. Ingredients: almond flour, cocoa powder, Sukrin :1 (Swerve or Lakanto), baking powder, mayonnaise, egg yolk, water. You might be shocked by using mayonnaise in a cake recipe, but trust me, it works! This is one of the best mug cakes I have made, soft and moist with a really authentic texture. The batter can be altered if you don’t want chocolate, but this one can be served with fresh berries for a fresher flavor. Once you have tried this cake you will never believe it is gluten, sugar and dairy free. Ingredients: almond flour, eggs, mayo, baking powder, cocoa powder, sweetener, water, vanilla extract. Here is another great recipe that uses mayo instead of dairy to keep the texture almost like regular cake. With this recipe, you get the option to frost the cake or just dust it with some sweetener, as it gives you links to a couple of keto frosting options. If you are not using frosting, this can be served with fresh berries or dusted with a little cocoa powder for a pretty look. Ingredients: full-fat coconut milk, apple cider vinegar, almond flour, coconut flour, ground golden flaxseed meal, cocoa powder, eggs, baking powder, baking soda, sea salt, monk fruit sweetener, coconut oil, pure vanilla extract, grass-fed unsalted butter. Not only is this one of the most decadent low carb cake recipes, but it is also ideal for coeliac sufferers as it is gluten-free. This rich, impressive chocolate cake would be ideal for a celebration or for a special dinner such as Christmas. Although this is a keto recipe, it does use quite a few dairy ingredients, so this cake should be used as a special treat and not a regular feature! Ingredients: almond meal or almond flour, unsweetened cocoa powder, sugar-free crystal sweetener, baking soda, avocado, dairy-free coconut yogurt, almond milk, eggs, vanilla extract, coconut cream, coconut oil, salt. This keto recipe is a great example of how using avocado in a cake mix retains the moisture and gives a fudgy texture to the cake. This cake is grain and gluten free and is very low in carbohydrates, so it would be great for a keto birthday treat. If you follow the ingredients exactly, you will have a rich and indulgent chocolate flavor, without a hint of avocado. Ingredients: butter, sugar-free dark chocolate, vanilla extract, sea salt, eggs, powdered erythritol. Like most flourless cakes, this one does not have the texture of a sponge cake but is smooth, indulgent and delicious, so you don’t miss any of the wonderful flavors of the chocolate. Once it is baked, it is really important to chill the cake for a few hours, in order to get the smooth, rich texture you expect. After that, feel free to decorate it or serve with fresh berries. Ingredients: almond flour/meal, coconut flour, cacao powder, natural sweetener xylitol, baking soda, salt, fresh raspberries, full-fat coconut milk, coconut oil, apple cider vinegar, vanilla extract, eggs, dark chocolate bar – 75% or higher. This amazing cake is not only decorated with fresh raspberries, but there are some incorporated in the mixture, so the flavor of the fruit permeates the cake as it cooks. Chocolate and raspberry is a wonderful combination and this could be made as a keto celebration or birthday cake. The cake can be stored in the refrigerator for a few days, so you could make it ahead of time then frost it when needed. Ingredients: hazelnuts, erythritol sweetener, almond flour, butter, unsweetened cocoa powder, full-fat cream cheese, eggs, liquid hazelnut flavoring/extract, vanilla extract. Isn’t it great how chocolate and nuts work well together in this spectacular dessert! You have a chocolatey base with a smooth and creamy choc/nut combo in the middle, then the hazelnut decorations on the top. This would definitely be a keto show-stopper at a dinner party! This is also a gluten free recipe, perfect to add to your collection if gluten is a problem in your family. Ingredients: almond flour, unsweetened coconut flakes, swerve/erythritol, chocolate whey protein powder, baking soda, salt, eggs, coconut oil, ghee, heavy cream, blackberries, dark/sugar-free chocolate chips. If you have a crockpot, it can be used to make cakes as well as main meals, so why not give this delicious keto cake a try! You have vanilla sponge, punctuated with juicy blackberries and little hits of chocolate. If you are not lucky enough to have fresh blackberries locally, you could use frozen ones, but they tend to go slightly squishy once they thaw. This recipe is low in carbs and keto friendly. Ingredients: 75% chocolate, butter, vanilla, eggs, double/heavy cream, granulated sweetener of choice. Here is another type of cake that is designed to be smooth and indulgent, not light and airy, so this is best used as a special dessert or a celebration cake. This is a great recipe for children as it is grain, gluten and nut free, so is unlikely to cause any allergy issues – but basically, it tastes like a little bit of heaven! Rich and chocolatey, this is amazing on its own but tastes even better with fresh berries. Ingredients: butter, erythritol sweetener, almond flour, unsweetened cocoa powder, salt, cream cheese, eggs, pumpkin puree, vanilla extract, ground cinnamon, ground allspice, ground ginger, ground nutmeg. In this beautiful keto cheesecake, you not only have pumpkin and all the spices that make it special, but it is marbled with chocolate and served on a chocolate base, and to be honest, this is a really impressive dessert or treat. The cheesecake has the texture you expect from regular ones, but with the delicious flavors of Fall. Best of all, any leftovers can be frozen, then defrosted as you need it! Ingredients: almond flour, powdered Erythritol or Swerve, cacao powder, gluten-free baking powder, sea salt, eggs, ghee, zucchini, sugar-free vanilla extract, unsalted butter, heavy whipping cream, Three Ingredient Keto Chocolate Truffles, dark chocolate shavings (use sugar free chocolate, or 85-90% dark chocolate, or even 100% chocolate). When you are following an eating plan for health reasons, it can be a bit challenging to find a celebration cake that even you can eat without causing issues, so take a look at this amazing layered chocolate cake! This would grace any table! If you have been eating keto for a while, you might need to take a look at the suggestions for making this a bit less sweet, but if this is for a special treat, indulge yourself! Ingredients: almond flour, walnuts, Sukrin :1 (or Swerve Granulated), coconut flour, cocoa powder, baking powder, salt, eggs, walnut oil (or melted butter), vanilla, stevia glycerite, full-fat coconut milk, Ghiradelli Intense Dark Chocolate 86%, heavy cream, coconut oil. This cake has a denser texture than some sponge cakes but is still soft and delicious. This is another gluten-free recipe that has options to turn it dairy free if you need to. Served with the chocolate ganache, this is a dessert that would impress any guest. When making the ganache, heat the chocolate very slowly otherwise it has the tendency to split. Ingredients: almond flour, ground hazelnuts, baking soda, raw cacao powder, eggs, ghee, sugar-free vanilla extract, boiling water, granulated Swerve or Erythritol, 90% dark chocolate, heavy whipping cream. Although this is quite an involved recipe that requires a fair amount of time in the preparation, this would be the ultimate in keto celebration cakes and whoever received it would be so happy! This not only looks good, but it tastes like chocolate heaven and is so rich and luxurious that it would even impress a picky person! Because this low carb recipe uses dairy, we recommend it is used as a special treat. Ingredients: unsweetened cocoa powder, granulated stevia/erythritol blend (Pyure), baking powder, sea salt, heavy whipping cream, vanilla extract, eggs, butter. Lava cakes can be a great way to impress your dinner guests as they will get the surprise when they cut into them and the lava oozes onto the plate! This recipe gives you a wonderful keto lava cake that is rich in chocolate flavor but still low in carbs and gluten-free. If you prefer your cake to be slightly less runny in the middle, just add on a couple of minutes to the cooking time and you will have more of a brownie texture. Ingredients: eggs, erythritol, coconut milk, almond flour, baking powder, baking soda, cocoa powder, ghee or coconut oil, vanilla, coconut whipped cream, heavy cream. Even the pictures of this lovely cake make your mouth water, especially when you realize that it is low carb, gluten and sugar free! Using the white frosting makes it look like a dessert you could even use at Christmas, then watch as your guests dig in and get a surprise at the rich and chocolatey center. If you are using xylitol, please be careful if you have pets, as it can be very dangerous for some animals.